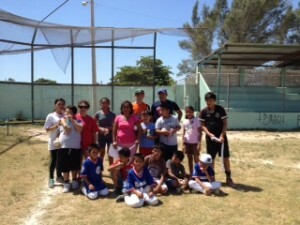 Thanks to our Mexican coach, Luis, the baseball team continued for an additional three months after we Snowbirds returned to the North. We started off again the third Saturday in January with 25 eager players. The following week, we had 37!! Due to rain and Carnival, the numbers were lower for the next two Saturdays but we expect a large turn out on the 21st. We have 8 to 10 Canadian and American “coaches” on any given Saturday and have had 3 Mexican parents on occasion. Our goal, of course, is to involve more parents, aunts, uncles and cousins in the hopes of getting the team back in Mexican hands by the time we all head North again. So, please spread the word that they are needed Saturdays at 9 am in the Chicxulub field! !